Keto vegetables enveloped in a rich, creamy, dairy-free, keto sauce. Topped with grilled salmon. 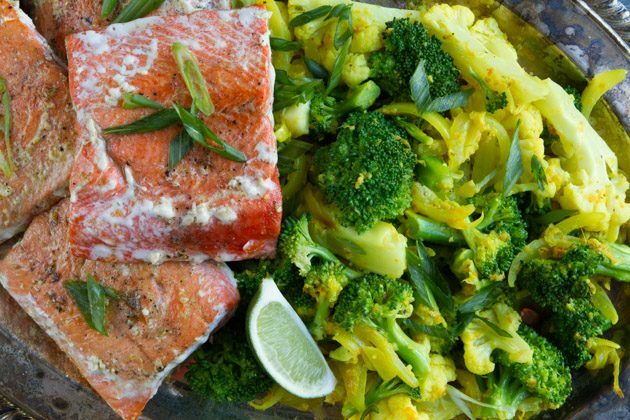 A quick and easy keto meal the whole family will love. I love having quick and simple keto meals to whip up on a weeknight. After a busy day, be it in the office or out on the road, there is nothing more satisfying than a freshly prepared home cooked keto meal. I like to know I’m nourishing my body from the inside out with a high-fat keto diet, but at the same time don’t want to have spend hours in the kitchen preparing a nourishing keto dinner. It’s all about finding that balance. This keto recipe was inspired by my partnership with Genuine Health who specializes in pain relief for people of all ages. 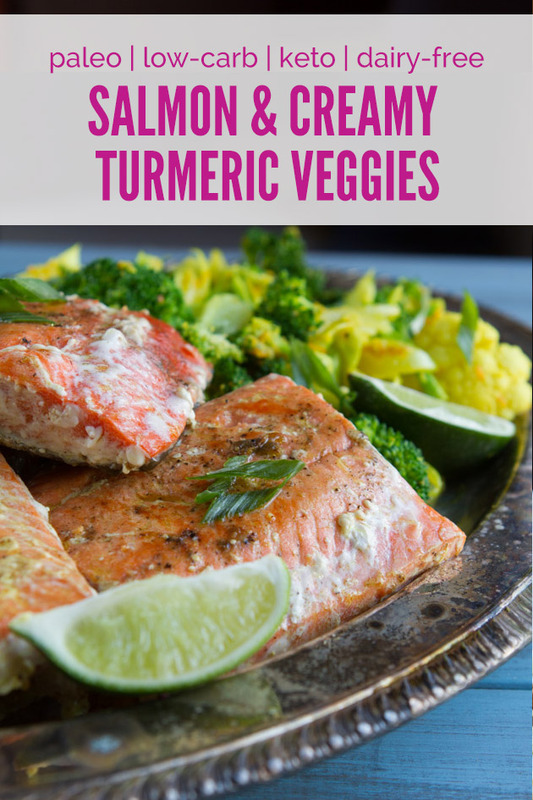 Both the naturally occurring oils in salmon and the turmeric lend themselves to being a potential way to impede inflammation in the body and forgo any associated pain. While the keto diet does a fabulous job at reducing inflammation, Genuine Health pain relief products allow us to go a step further for those that need it. 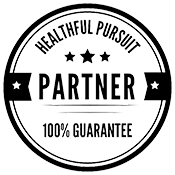 The range of products Genuine Health offer is incredible. 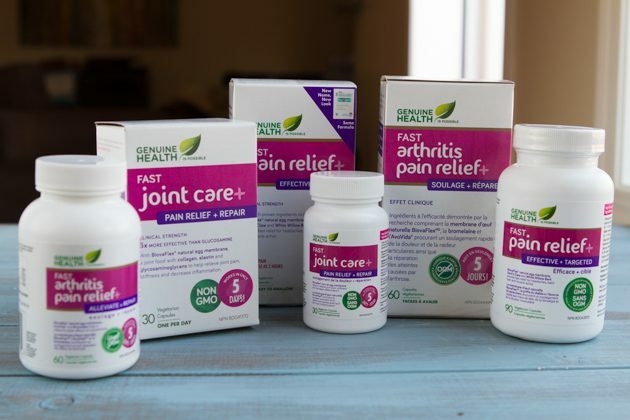 Made of all natural ingredients they offer benefits for people seeking general pain relief, arthritic pain, and more generic joint pain. Biovaflex®, Bromelain and AvoVida® are the three-star ingredients. They work in synergy providing complete joint care. With Biovaflex® offering proteins, collagen, and elastin, Bromelain being a natural anti-inflammatory enzyme found in pineapples, and AvoVida® increasing joint space lost from degenerative diseases such as osteoarthritis. They’ve had quite the success rate with users reporting pain relief in just 5 days; 5 times more likely to offer pain relief of up to 50% when compared to the success rate of glucosamine under similar circumstances. And sure why not eat to create an all-embracing approach to your joint health! Heat the oil in a large frying pan or cast iron pan. Add the onion, garlic, ginger, and turmeric. Cook over medium heat, stirring often, until golden, about 8 minutes. Add the coconut milk, water, lime zest, and lime juice to the mixture and bring to a simmer. Stir in the vegetables and season with salt and pepper. Cover and remove from the heat. Preheat a grill pan. Rub the salmon with salt and pepper. Grill with the skin side touching the pan over medium heat for 5 minutes. Turn and grill until cooked through. 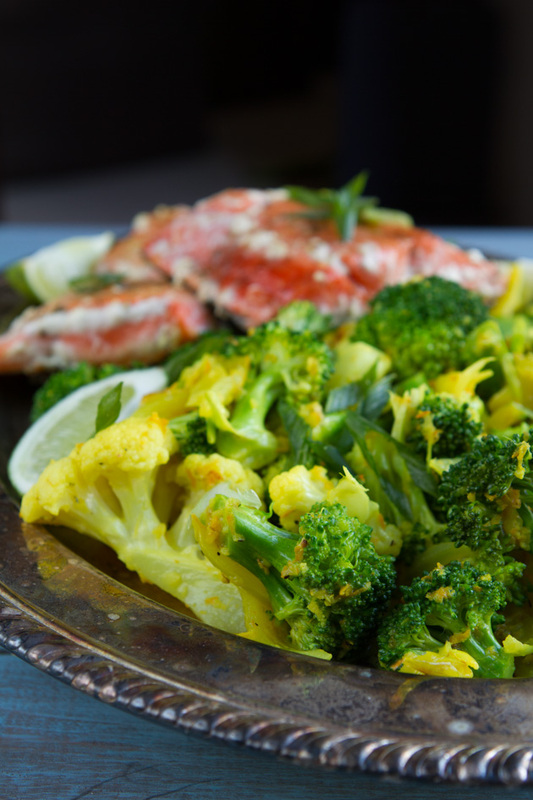 Transfer salmon and vegetables to a serving plate and dig in. Fresh Turmeric: you could swap for powdered turmeric. Recipe ingredients provided by SPUD.ca. Get $20 off your first organic grocery delivery when you use the coupon code PURSUIT20. 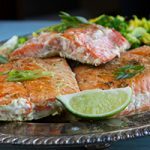 What recipes do you use for preparing keto-friendly salmon? Share your keto, high-fat, low-carb paleo recipes in the comments below. I’d love to check them out, and I know all of the other peeps in our community would, too!